Each of us will give an account of himself to God. Let me start by making it clear what kind of accountability we have before our God. If you have placed your trust in Jesus Christ’s atoning work on the Cross, you will NOT account for your sins. Jesus has already paid that account in full on the cross. But we Christians will account for the life we have lived as His people. At the bema, the judgment seat of Christ, rewards will be given for the lives we lived by grace through faith; this is where we will bow and lay our crowns at the feet of the Lamb who alone is worthy to receive all glory and honor and praise. Keeping that truth firmly in mind, let’s take a brief look today at the first of three primary areas (Time, Talent, and Treasure) for which we will be held accountable by the Almighty. I often tell our congregation that we are all dying at the rate of 60 minutes an hour; when you spend an hour, you have one less hour to spend . . . so spend it wisely! We have been given this gift of time to live and to serve by “the God who holds your breath in His hand and owns all your ways” (Daniel 5:23 NKJV). And so we are all debtors to the one who gives us “life and breath and everything else” (Acts 17:25); the wise stewardship of our time is a debt all men must pay. Eventually we will breathe our last . . . and then we will give an account for how we spent that time. So . . . what are you doing with this gift called time? Remember, if you have money and lose it you can always get more money. But what you lose in time you can never get back. The psalmist writes, “Show me, O Lord, my life’s end and the number of my days; let me know how fleeting is my life. You have made my days a mere handbreadth; the span of my years is as nothing before you. Each man’s life is but a breath” (Psalm 39:4-5). We must remember that, in the end, our lives will not be measured by their duration but rather by their donation. So let me ask you a second question: what have you been donating your life to lately? Have you been working to expand your kingdom or God’s kingdom? The choice is always yours! 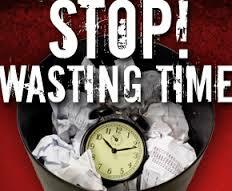 Question: What is the greatest time waster in the world? Answer: Doing something God does not want you to do and then having to clean up the mess after! Can you relate to that? I know I’m not the only who can! The key to maximizing the fleeting span of time God has given to us is remembering to keep the main thing the main thing. The years have taught me that the secret to saying NO to some things is to have a bigger YES to pursue. And that bigger YES is the Lord Jesus Christ and the expansion of His kingdom. In the next article, we’ll take a look at our use of our talents.